Robin Steinberg took the stage as the first speaker presenting in TED’s newest initiative: The Audacious Project. In only 15 minutes she would need to both educate the audience about the problematic nature of the current American bail system, as well as detail her solution and why we should support it. Steinberg had to manage what every speaker navigates while planning a presentation: How much information does your audience need in order for them to understand what you’re speaking about? Many speakers believe that having more time to speak must mean a better presentation. This simply isn’t true. The truth is when it comes to educating your audience, less is often more because your main point is allowed to shine through, rather than get buried in extraneous information. Too much information can overwhelm, bore, or agitate your audience. So how much is just enough? You can watch the TED Talk I’m analyzing here to follow along, or watch afterwards. This is the guide I use to help my TEDx speakers deliver incredible speeches. Download yours today! Let’s go back to Steinberg’s talk. First, she opens with a brief, but detailed, description of the physical environment of meeting a client in jail. She knows that her audience has most likely seen any number of crime procedural TV shows, so her description is kept to physical sensations to set the scene. She wants us there with her visualizing the experience, because humans make decisions with emotions and we need to feel what she’s saying before she introduces the statistics. Next, she gives us a few key (and alarming) statistics about incarceration in America. She knows that her audience is educated, but she doesn’t assume they all know how significant of a problem this is. The statistics she provides are enough to establish there is a problem, without overwhelming her audience or boring them with endless data. She chooses a few stark comparisons (slavery to mass incarceration) and then goes with one of the most effective educational tools: a story. In this case it’s the story of Ramel, a father who was arrested for a minor infraction (riding a bike on a sidewalk), and then thrown in jail – specifically a floating jail barge in New York, like something out of a 90’s action movie. Here’s why this is so effective: without hearing about Ramel’s plight, this problem stays cold, disconnected data, and we are not terribly moved. But hearing Ramel’s story brings this problem to life, and (if you’re like the audience I was sitting with during this talk), makes you angry about the injustice of it all. In only three minutes Robin Steinberg masterfully introduced the problem, created an emotional sensation to connect the audience, and gave a human face to the issue. Now we’re hooked, and we want to learn more. Steinberg uses Ramel’s experience to explain the entire situation: here’s what he experienced, and here’s how it’s a common experience amongst lower income and typically marginalized people. And, most importantly, here are the long-term consequences for this experience. Not just for the people being arrested, but for the tax payers footing the bill for this injustice. In fewer than six minutes Steinberg has not only explained the nature of the problem, but she’s helped the audience understand how it impacts us well. However, Steinberg isn’t here to just talk about the problem; she’s here to outline her vision for a solution, and get audience buy-in for that solution. The Audacious Project is a way for visionaries like Steinberg to get the funding they need to execute their ideas. Just past seven minutes in, Steinberg begins detailing her plan. As she goes through each step, she offers one or two key statistics to validate her ideas. She masterfully keeps from going off on semi-related tangents, and stays laser-focused on the idea at hand. She trusts her audience to give them enough information to be credible, but not so much that they’re swimming in data. How do we know the audience is with her? Pay attention to the applause. At roughly the ten-minute mark Steinberg is now expanding on her idea, and she’s using Ramel’s story to show how the idea works, and why it’ll be successful. She skillfully weaves in the human element of a real-live beneficiary of this project, along with the data showing its efficacy on a mass scale. Steinberg used slides like this one, using a key fact emphasized with a visual representation, to support her points. Throughout the talk, Steinberg uses slides the way a chef uses salt: to amplify the flavor, but not to be the main feature of the dish. All of her slides feature the statistics and data she’s offering up to the audience, as well as photos of Ramel, and a few graphs showing her idea in action. They’re clean, colorful, and easy to understand. But most importantly, they serve to educate her audience in a simple and accessible way. Finally, Steinberg ends her talk with an impassioned call to action for everyone watching. She’s outlined the nature of the problem, offered enough context and data so we understand how this problem affects us all, and how her solution will change lives. Now she needs our buy-in, and based on the standing ovation she got both live in Vancouver and from TEDFest in Brooklyn (where I watched this talk), she has it. Steinberg expertly demonstrated that you do not need overwhelming amounts of time or information to effectively educate your audience. Rather a few key facts, stories, and visuals can work together to support a powerful idea and connect with the audience. We turn to TED Talks as shining examples of what public speaking can do: share ideas, persuade people to action, and make the world a little bit better. But I also encourage you to start analyzing what makes these presentations so exemplary in the first place. 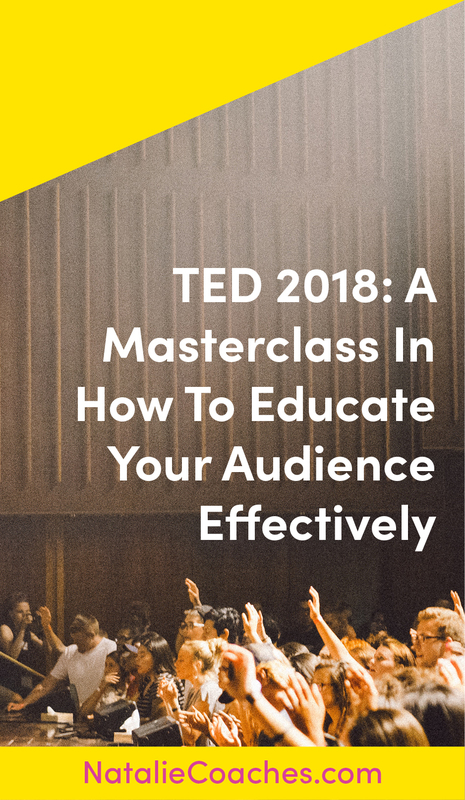 TED Talks dispel the notion that a speaker needs to give the audience mass amounts of information, speak for lengthy durations, or overwhelm them with data. They are a masterclass in how to educate your audience effectively, efficiently, and enjoyably. Want to learn how to educate your audience effectively? Then subscribe to my newsletter to get my Free guide on writing a killer presentation!